Full finger protection for long day's in the saddle.. 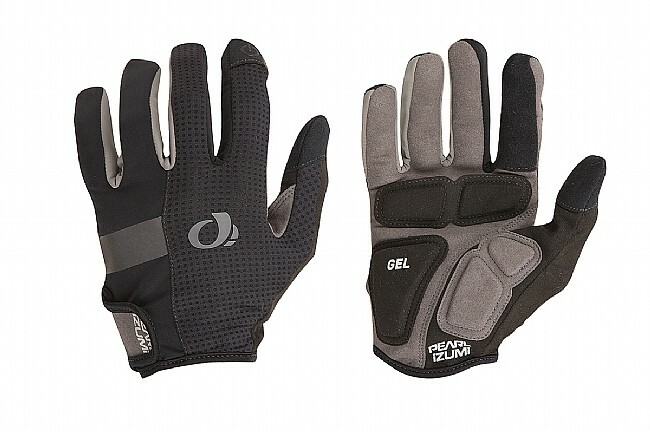 The Men's Elite Gel is one of Pearl Izumi's most popular gloves, and this iteration refines it further with reduced seams and custom-molded gel inserts for superior comfort that lasts. A synthetic leather palm ensures the Elite Gel Glove holds up for the long haul, and extra conveniences like a wiping surface on the thumb and easy-off removal tabs put the finishing touches on Pearl Izumi's benchmark cycling glove. Features a hook and loop closure. Available in multiple colors. These are comfortable shoulder-season gloves. The velcro closure works well, but it's a mirror image of the closure on my winter gloves, so it always takes me a second to orient the gloves correctly. But that's hardly a major issue. Excellent light weight full finger glove for transitional weather days. Ideal glove for cool but not too cold weather rides. Runs a bit small. A great comfortable and durable glove for trail and road riding. I purchased these gloves for trail use but a colder winter has also made them my primary road glove. Even after repeated machine washings they look and function like new. Fit was true to size and the finger swipe works well. I highly recommend these gloves. The sale price made them an even greater value. These are light-weight gloves that fit and feel good. Typical Pearl Izumi quality. But they offer little warmth (if thats an issue for you) theyre not very tactile for touchscreen devices. these gloves are great for temps down to 55-60 degrees and the fit is great. Not too bulky plus good padding. Even if the temps warm up in the 70s still are comfortable.